If garlic is the rose and onions are the pearl, then shallots are the jewel of the Allium family. We picked a few shallots for market this week, they are getting close to full maturity. They are beautiful big shallots. 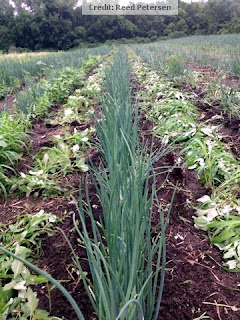 We typically plant in a double row like we do onions and we used lots of organic fertilizer. One of the rows was planted to a single row and had the benefit of enough fertilizer for two, so the shallots are really jumbo in that row. Shallots have the delicate garlic flavor that the gourmet chefs love to use to give dishes that light fresh taste so unique to shallots. They don't yield as well as onions so they are a little more expensive but they are well worth it. Fresh shallots are amazing. Starting this week we will have new crop shallots. We just finished the last of the shallots from 2012 so they keep amazingly well. Very few sprout at normal conditions, unlike onions, that often sprout if the conditions aren't just perfect. Yet they know when to grow very quickly when planted in the soil in the spring. We keep our own shallots for seed from year to year. I got the original seed from Peaceful Valley Farm Supply, in Grass Valley, CA about 10 years ago. They are French shallots. Unlike garlic where you want to plant the biggest cloves possible, small shallots can grow several large shallots the next year if given excellent conditions. I see in the seed catalogs you can start shallots from seed but I have never tried it. Seems like they'd not have enough time to size up. But I can't speak from experience. When you grow shallots from shallots you keep from the previous year that is called a set, just like it is for onions; which make them identical. Shallots are a green leafy plant that likes extra nitrogen for the first 1/3 of the growing season. Then when we hit the long days near the end of June the shallots become storage machines and really start putting on the pounds. We back off on the fertilizer and watch the amazing transformation. They need an inch of water a week until the last two weeks before harvest, when they need to dry down and cure. I'll include some recipes using shallots in future blogs. Is Okra a Vegetable for Dixie, Ya Shure?